Avid readers of Brighter, Darling know I’m always trying out skin care products to obtain and maintain an even, balanced glow. 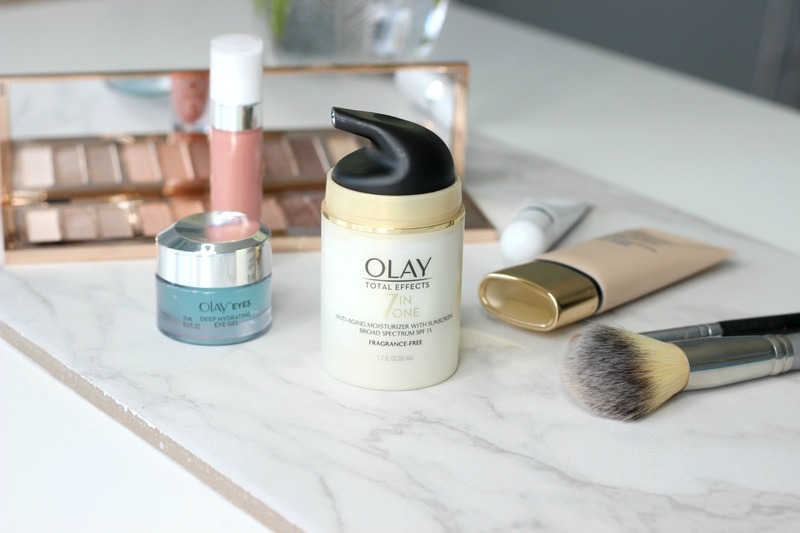 What you may NOT know is that the gateway into my skin care love started with Olay. It was the very first facial moisturizer I ever used and it taught me the importance of protecting my skin with SPF and that oily skin still needed to be moisturized. Plus, the right moisturizer makes for better makeup application! Now that I’m in my early 30s, prevention is paramount. Fine lines are creeping up, dehydration is a constant battle and gone is the youthful plumpness around my eyes. However, I’m not yet ready to slap on a heavy anti-aging cream. I still break out and I still get pretty oily. It’s a lovely combination to manage. It does this with VitaNiacin Complex II with Vitamins C and E.
In addition to the moisturizer, the Olay Eyes Deep Hydrating Eye Gel ($27.49) feels as good as it looks AND outperforms the top 5 prestige eye products for hydration and tired eyes. 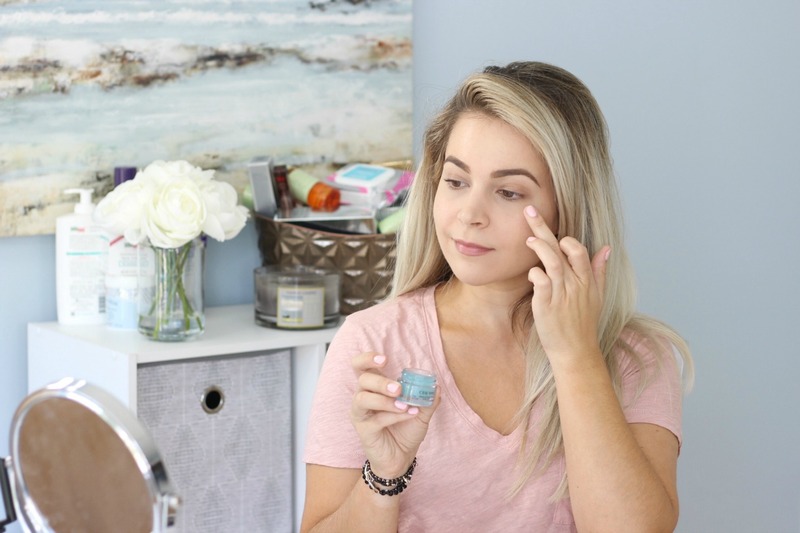 The clear, cooling gel formula is packed with Hyaluronic Acid to plump the skin around the eyes (my biggest issue) and absorbs quickly so it works nicely in the morning under makeup. When I started the #Olay28Day Challenge, I was hoping to find ONE moisturizer that could do what my five different serums were doing. As much as I love beauty products, I also have to get ready for work and take care of two fur children in the morning. I used the moisturizer every morning, and I used the eye gel both morning and night – both under the eye and on the eyelids. 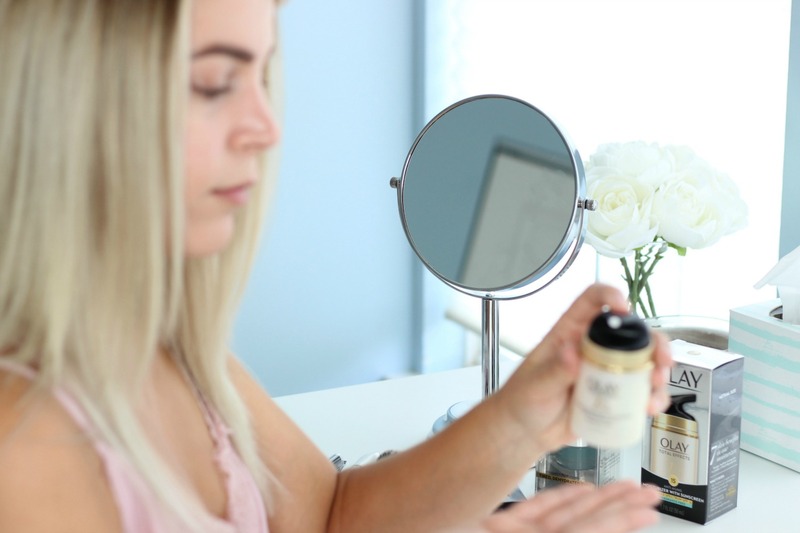 Within the first couple of weeks, I noticed more even tone on my face and makeup would glide over with no flaking (which happens often to me because I use retinol). 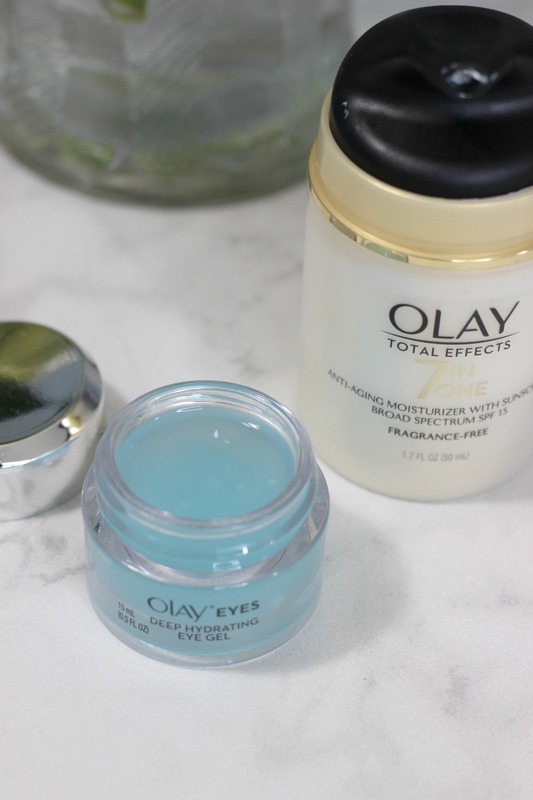 Most noticeably though, was the visible improvement in my eye area using the Olay Eyes Deep Hydrating Eye Gel. It literally feels like you’re applying 12 glasses of water to your eye area – like an instant quenched effect. When I take makeup photos for the blog and I DON’T use my favorite full coverage concealer, I can tell a difference under the eyes. Recently, I took photos and decided to use a lesser-coverage concealer and did not notice as dramatic of a difference. My eye area looked plump and doesn’t need as full coverage of a concealer! Upon completing the 28 Day Challenge, the time of my morning routine is cut down by at least 50%. My makeup applies smoother and looks prettier because my skin is becoming noticeably healthier. If the eye gel ever goes away, I will have to hold a memorial because I cannot be without it now. LOOKING FOR A NIGHT CREAM? CHECK OUT MY OLAY REGENERIST EXPERIENCE. Olay knows that skin care can be overwhelming and there are tons of products that sound like they could work for you. They know you go home from the store, try a product for a couple of weeks often push it to the side because it’s not working. Olay now offers a personalized Skin Advisor that will provide product recommendations that feel right for you. 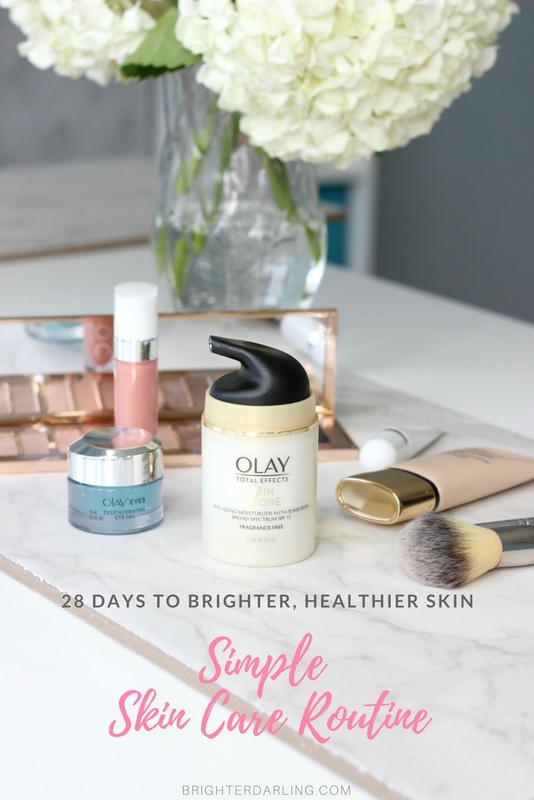 My first 15 readers to complete the Olay skin analysis and use coupon code 28DAYS8298 get $40 off their purchase of the recommended products on Olay.com! Ready for a customized skin care routine with maximum benefits? Go to Olay.com and try Skin Advisor to get your perfect routine. Let me know if you end up trying the same products I have; I’d love to hear your results. Reference is made to the agreement (the “Agreement”) by and among (“Influencer”) and MMI Agency, Inc. (“Agency”) on behalf of its client, Olay (“P&G”), effective as of August 30th, 2017. Defined terms not defined herein shall have the same meaning as set forth in the Agreement. In order to ensure Influencer’s compliance with the Federal Trade Commission “Guides Concerning the Use of Endorsements and Testimonials in Advertising,” Influencer hereby certifies as of the Effective Date of the Agreement to the following:1. that any testimonial or endorsement made in any YouTube Video, social media post or other means of mass communication, including, without limitation, newspapers, magazines, radio, television or Internet media outlets, directly by Influencer regarding any P&G product or service (each, a “Public Communication”) shall reflect the honest opinions, findings, beliefs, and/or experiences of Influencer with respect to such product or service;2. that Influencer shall promptly notify Agency if any of Influencer’s opinions, findings, beliefs and/or experiences with respect to any P&G product or service change from that which Influencer has previously expressed in any Public Communication or to Agency prior to or during the Term of the Agreement; and3. that in connection with any testimonial or endorsement made by Influencer in any Public Communication regarding any P&G product or service, Influencer shall affirmatively and conspicuously disclose that he or she is a compensated endorser of P&G and its relevant products or services in close proximity to such testimonial or endorsement. "September 2017 Beauty Favorites [BONUS: YouTube]"
"Save vs Splurge Beauty Trends Fall 2017"